The C152 II FIP Gauges are the fourth set just updated in the last few days. Major changes include an extra 4-digit QNH Altimeter version and overall graphical enhancements. Not much changes in codes as they were updated just a month ago. As usual, users of the gauges should have received the download links by now in their mailboxes. Although more updates are coming but that is all for this week. The four updates in the last few days should keep most users busy for awhile. The FIP gauges for the default Piper Cub have just been updated to version 160625. In addition to a number of coding and graphical enhancements that make the gauges more outstanding from the background, an extra 4-digit QNH Altimeter version is also added to the package. Users of the gauges should have received the new download by now. Following the RealAir Duke, the FIP gauges for the Aircreation 582SL have also been updated. The new version 160624 includes a number of coding and graphical enhancements, in addition to some minor bugs fixed. Users of the gauges should have received the download link by now in their mailboxes. 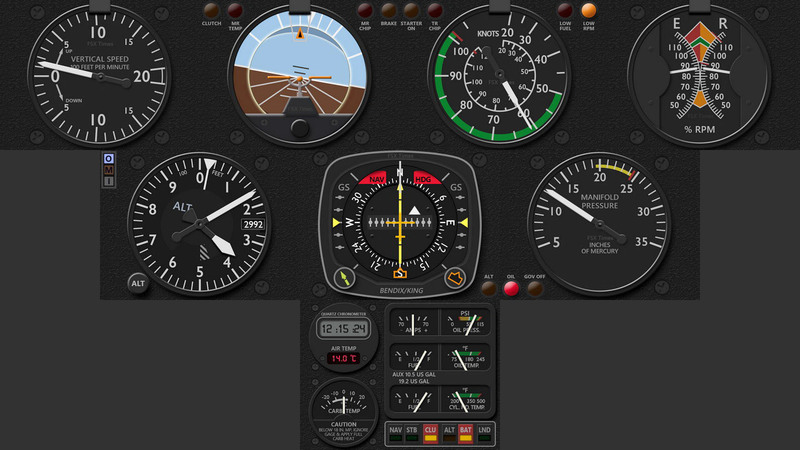 The RealAir Duke Gauges have been updated to version 160622, which includes a number of fixes and major graphical enhancement, plus the additional “Extra” VSI version and Oil Quantity in Turbine Engine set. Existing users should have received email(s) containing the download links and related information by now in their mailboxes. Another upgrade to come soon is the GaugeSwitcher utility. The new version will not only simplify UI and operations, but also has the ability to delete unwanted profiles from the list. Most importantly, there will be no more needs of pressing “Esc” during switching. The R22 Robinson Gauge Set for the Saitek FIP is finally completed. It was requested by some helicopter fans many months ago. Equipment in the R22 cockpit, from compass to flight instrument, and from clock and warning lights to engine gauges, have all been integrated into this 9-FIP gauge set. The Moritz Digital Engine Gauges for the Duke Turbine V2 are now ready, which completes the two RAS Duke gauge sets released earlier in March. This engine set consists of six gauges in pair format, including the Torque (TRQ), ITT Temperature, NG %RPM, Prop RPM, Fuel Flow and Fuel Pressure. One known issue — small deviations sometimes appear on the NG %RPM and Prop RPM gauges due to the two gauges using local variables (Lvars), which the Saitek FIP driver doesn’t support. It’s more prominent when the aircraft is on the ground, and less significant in the air. With the release of its latest Library 160528, Orbx announces its soon-to-come unified lclookup (landclass lookup) update, which will completely eliminate the need of switching regions via FTX Central anymore. No doubt it’s a good thing. But since regions and scenery will all be active under the new environment, will the startup loading time be prolonged proportionally or even significantly is yet to discover, not to mention any unknown potential performance hit? The size of the library is now triple of previous versions. Let’s hope for the better, nevertheless. EDIT 1: The new FTX Central is already available. EDIT 2: Just had a quick flight and didn’t see any performance hit.